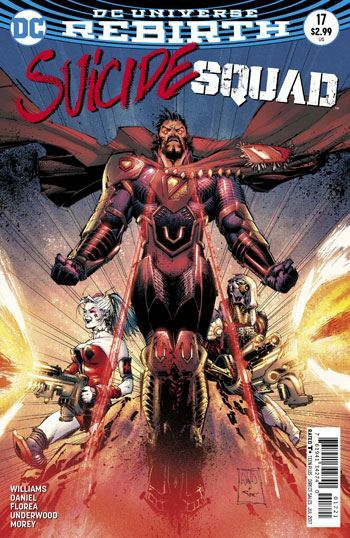 Zod is sent on his first mission with the Suicide Squad in issue 17, to take out the Annihilation Brigade, along with all the regular Squad members. It’s a solid story. 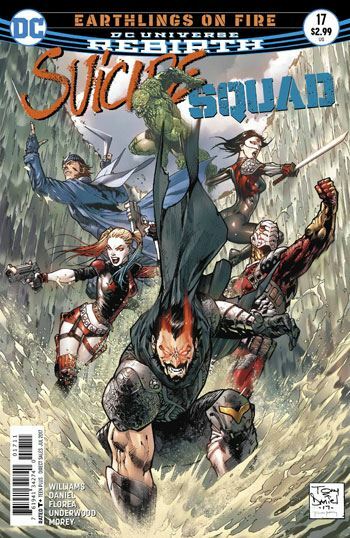 The parts with the Squad are action packed, as they face off against a number of decent villains, largely cannon fodder. The most entertaining of the Brigade is the one to survive. Frankly, the only one I wanted to see more of. But the real action is taking place back at Belle Reve. Harcourt finally makes her move. She has been a double agent for The People, and sets out to take down Belle Reve from the inside. Zod operates fairly well as a member of the Squad. Of course, it is hardly surprising that he has no intention of remaining a member for very long. There isn’t as much humour in this issue as in previous ones. Harley Quinn gets some amusing lines, but Enchantress is back to her normal serious self. A shame. I really enjoyed the twisted way she had been scripted in the previous issue. Really, the best pages of the story are the climax and epilogue. Which means I don’t want to share anything about them, and ruin the surprises. Still, as much as I enjoyed this issue, I do continue to bemoan the lack of political commentary in the book. The entire notion of the Squad is so well suited to that kind of thing. With the insane developments emerging daily from the US, turning a blind eye to it all seems downright negligent, if not outright complicit.